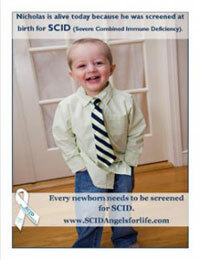 SCID, Angels for Life was also the recipient of pledges for Tim Schwarz’s “Stop SCID for Kids” run in the Chicago Marathon on October 11, 2009. Julie and Tim Schwarz are the parents of four year-old Caz, who was diagnosed with SCID as an infant and they wanted to find a way to help other families affected by SCID. Despite having never run a marathon before, Tim trained hard and finished the 26.2-mile run in 4 hours and 22 minutes. His amazing efforts garnered pledges in excess of $7,000. Tim’s effort exemplifies what one individual can do to make a difference.